ladies next size 12. Never worn Dispatched with Royal Mail 2nd Class. 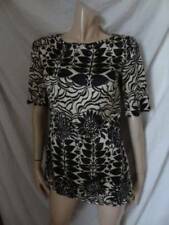 ladies next blouse 16 - only worn once, stunning too and gorgeous. Dispatched with Royal Mail 2nd Class. Any questions please as - please see my other listings. Next Cream Top 20. Condition is Used. Dispatched with Royal Mail 1st Class. Very pretty ivory/white crew neck fine knit jumper from Next. Delicate cutout lace arm panel and lace hem trim. Next Top 20. Condition is New with tags. Dispatched with Royal Mail 1st Class. Next Cold Shoulder Champagne Sparkly Long Top 16. Condition is Used. Dispatched with Royal Mail 2nd Class. Thin Knit Long Sleeve Top By Next Size 18. Worn once so like new. Dispatched with Royal Mail 2nd Class. *** SELLER AWAY TIL 25th FEB ** NEXT Ladies Women’s Girls Heart Print Pyjamas Size 12-14 BNWT! NEW Xmas Gift. Condition is New with tags. Dispatched with Royal Mail 2nd Class. Next Ladies Ivory Crochet Cardigan With Flower Detail Size 14 Excellent Condition Here is the chance to bid on this lovely soft feel cardigan, ideal for the Summer. The cardi has only been worn 2-3 times so is in excellent condition with no threads or pulls. Please feel free to email me if you have any questions. Next Over Top Sheer Panel at top and bottom. 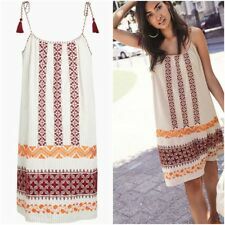 Length 73cm shoulder to hem. Next Ladies Cream Lace effect Off The Shoulder Top 14 VGC. Condition is Used. Dispatched with Royal Mail 2nd Class. Next Womens Summer Top Size 10. Condition is Used. Dispatched with Royal Mail 2nd Class. Next fully lined genuine leather, has been worn & has some marks on inside sleeve shown in pictures but hardly visable. Come from pet and smoke free home, payment within two days of winning the bid thank you. Next Ladies Victorian styled chiffon type blouse. length 26 ins. 20 ins from under arm across the bust. lace on the front. long plain sleeves gathered to a cuff. This top has been worn but is in a good condition. 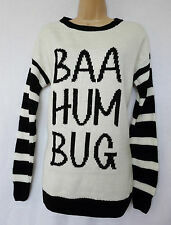 Women’s Next Jumper Size 10. Chunky Cable Knit. Women’s Next Jumper Size 10. Cream knitted jumper with zips on both sides and chunky cable knit. Worn but in excellent condition. Dispatched with Royal Mail 2nd Class. Next Beach Dress Size 14. Condition is Used.In brand new condition.Please look at my other items as I am having a clear out.Dispatched with Royal Mail 2nd Class. SPRING YEAR CLEAR OUT! Ladies Collared top by Next. Cream/ivory colour. Size 12. In very good used condition. Please have a look at my other items, as I can combine postage costs if you're the successful buyer for more than one item. Feel free to ask any questions. Thanks for looking and happy bidding! 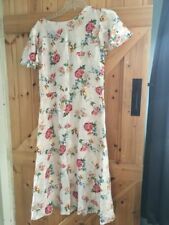 Ladies Next summer dress size 18. Holiday. Ladies Next summer dress size 18. Holiday.. Perfect for summer or holidays. Tie straps that can be adjusted. I always post 2nd class signed for and retain receipt as proof of postage. In great condition. SPRING YEAR CLEAR OUT! Ladies sleeveless cardigan by next. Cream/ivory colour with attached white vest underneath. Size 10. In very good used condition. Please have a look at my other items, as I can combine postage costs if you're the successful buyer for more than one item. Feel free to ask any questions. Thanks for looking and happy bidding! next cream top 16. Dispatched with Royal Mail 2nd Class. Next Sleeveless Cream Blouse. Size 20. Condition is Used. Dispatched with Royal Mail 2nd Class. STRETCHY FINE COTTON MATERIAL. BUTTON DOWN COLLAR. TWO BREAST POCKETS. USED BUT IN GOOD CONDITION. LADIES NEXT SHIRT. This top is a 14 Petite. Woven front and jersey back. Looks great with jeans or smarter trousers. Ladies Off White Fringed T-shirt /Top From Next. next beach cover up 14. Dispatched with Royal Mail 2nd Class. Next Tall 14 Lace Dress. Condition is New with tags. Dispatched with Royal Mail 2nd Class. Ladies cream blouse/top by NEXT . Size 16. 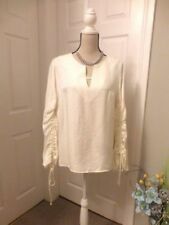 Ladies cream blouse/top by NEXT. Size 16. Excellent condition.... worn once. From a clean smoke free home.